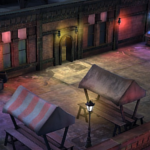 Any fan of isometric games should take notice that Empyre: Lords of the Sea Gates releases soon, an alternate reality title taking place in an industrial 1911 experiencing environmental distress. I chatted with Creative Director John Randall for insight into his goals and process, concealing no small amount of excitement for the Coin Operated Games release. 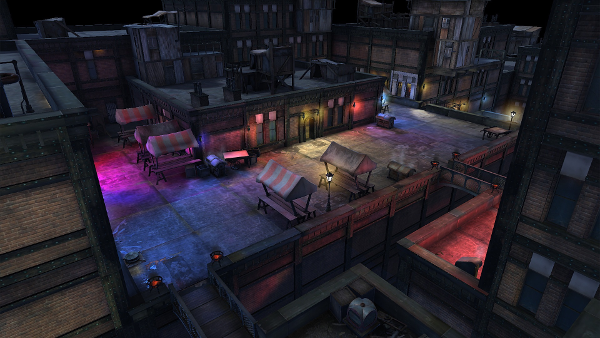 Erik Meyer: Empyre drops players into the tumult of a flooded Neo-Victorian New York City filled with adventure. Regarding the environment and the universe you’re creating, what do you see as the highlights that set it apart from other historical fiction taking place in a similar period? John Randall: Our divergent path really kicks in before the flood with a world we like to call Neo-Victorian. It is similar to Steampunk in its reliance on Steam Technology but it is less Dystopian. The World’s Fairs that occurred in the 19th Century really brought a highly optimistic view of the future to the people. 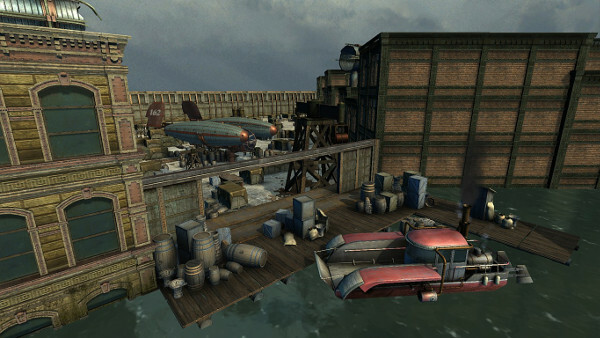 This is something we wanted to exaggerate with tech like Sky Trains in order to make the fall (the flood) more dramatic. At the same time, we currently live in a world where the specter of our coastal cities flooding hangs over us. So we wanted to bring that element into the back story as well. EM: The gameplay user interface lays out in a similar fashion to other isometric RPGs, but I’m curious what special considerations you’ve been making in this area, in terms of how elements contribute to game flow, ease of access, and user intuition? What is your philosophy behind menu layout and giving players access to the things they need? JR: We were fortunate to have a UI specialist work with us to create an optimal interface for our gameplay. Even then, we had a few reworks to improve it. Technically, we worked on the things you mentioned: ease of use, trying to keep the UI as familiar and comfortable as possible for the player and minimizing the effort required to perform whatever actions the player wishes. Beyond that, there is also fitting that UI into your game space in a way that is not jarring to the player. How it presents itself to the player and how well it blends into the game itself is also important. EM: Regarding 2D art, 3D assets, and features like audio and menus, what considerations do you give to an overall consistent tone and feel within the narrative experience? How do the developers within your team maintain a unified voice, and what does that process look like for you, as a studio? JR: For us it is mainly about quantification of influences and simplifying the art direction that goes out to all the artists. So the base for us was Victorian first with a sprinkling of Steampunk and a chunk of 1970’s funk where appropriate. To give the game an unique style, the 1970’s was a good fit for us. Big cars meets big steam vehicles etc. EM: As one aspect influencing character development, players and companions each have a Profession. What went into mechanizing options such as choosing a vocation, and how deeply do you, as developers, want these kinds of customizations to impact play? JR: Professions came into the game through the Story Treatment provided by our amazing writer, Paul Noth. Having a character who was once a Sandhog (the men who dug tunnels under New York City) is such a great way to express who your party members are. In terms of mechanization, we did not want to have structured character classes. So Professions was the perfect way to define the skills and other abilities that a character has and how his chosen vocation has offered him certain advantages and disadvantages. In the game, these Professions have had a major impact. For instance, Sandhogs have training in the use of demolitions. EM: A number of the combat examples in the game trailer show large-scale brawls taking place. As you’ve developed the combat system, and with respect to the isometric RPGs of yesteryear, what do you see as strengths of turn-based combat, and what kinds of challenges come with it, both from a developer and a game flow perspective? 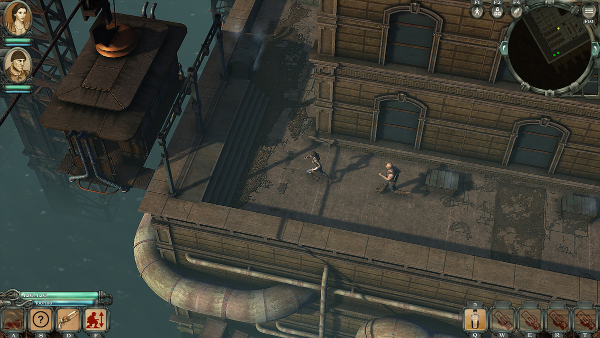 JR: Just to clarify, our game has a planning phase and then a simultaneous execution of actions. 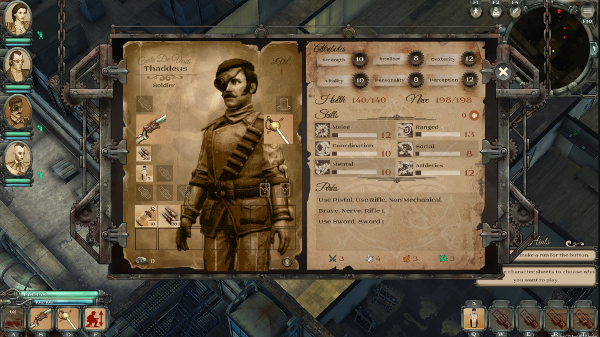 So it is not strictly turn-based but does offer you many of the tactical benefits of turn-based combat. To us, the tactical/strategic planning element in turn-based combat is the most important part. How you spend your Action points. In our game, you do not spend Action points but instead spend your time in seconds (each action costing you a set number of seconds to perform). This was our way of allowing the player to allocate resources (in this case, Time) and develop a plan of action. The challenge for our programmers and designers to innovate a system where multiple entities move, fire and perform other actions based on the player’s instructions is quite substantial. What happens when two entities want to enter the same tile at the same time? Or what happens when a targeted enemy moves out of sight or range? And there were many more questions like that which needed to be addressed. However, the end result was worth it and we are certainly pleased with how it turned out. EM: Part of the fun of alternate histories is filling the game world with quirky stuff and the period-specific objects of ages past. On a granular level, what kinds of things have made you smile in accomplishing this goal, and what do you see as integral, from a research and implementation point of view? JR: There is no better feeling than rummaging through “The Gangs of New York” or “Professional Criminals of America” and getting hit by a Eureka moment. The Victorians loved scandals and loved stories. So the wealth of material to pull from is awe-inspiring. It also is quite funny. There seemed to be an awful lot of gun fights in New York yet very few casualties: thirty guys hiding behind barrels blazing away at each other and the end result is two or three fellas with light wounds. In terms of its importance, I don’t think you can create an authentic experience for a player without this kind of research. EM: Games often struggle to balance combat versus story, dialogue versus quests, etc. Some players reject too many conversations or complicated quests, and others don’t want to grind through long dungeons. As developers, how do you see this balance taking place within your project, and what kinds of criteria and experiences take priority? JR: This really comes down to the writer you have. We were extremely lucky to have Paul because he delivered what we needed. A great story simply told without an excess of text. What he wrote is very entertaining with great characters and colorful dialogue. Our goal was to keep the player focused on his goal throughout the game. So we put in some side quests and flavor dialogues, but none of it was designed to drag the player off course for too long. For combat, we tried to create as much variety as possible and break it up with non-combat encounters, too, so the player does not get bored. If you don’t do this, the player can sometimes forget or get lost trying to remember what he is playing the game for. It also allows you to keep the tension of the main quest sustained over the course of the game. EM: For most studios, having a clear view of what constitutes success is key, as is limiting the scope of a project to essential must-have elements. In your case, what do you see as vital to Empyre, from an implementation standpoint, and what things have had to go by the wayside? JR: The most important elements of the game from the beginning were the story and the setting. The other keys were to create a fun, easy to manage combat system with strategic elements and to make it an RPG. So every feature and design decision centered around delivering those core elements to the player. There were some things that did go by the wayside but those are earmarked for sequels. So it is more a matter of when than if regarding cut features. It also gives us the opportunity to evolve our line of games in a predetermined fashion in the future.